University of Cambridge researchers have developed the world’s tiniest engine, capable of a force per unit-weight nearly 100 times higher* than any motor or muscle. The new nano-engines could lead to nanorobots small enough to enter living cells to fight disease, the researchers say. Professor Jeremy Baumberg from the Cavendish Laboratory, who led the research, has named the devices “actuating nanotransducers” (ANTs). “Like real ants, they produce large forces for their weight,” he quipped. As reported in the journal PNAS, the prototype ANT device — just a few billionths of a meter in size — is made of gold nanoparticles bound together with temperature-responsive gel polymers. It can function as a piston or spring and works in a reversible cycle. Loose nanoparticles in water are first heated. When the temperature reaches 32 degrees C, they suddenly aggregate into a tight ball. 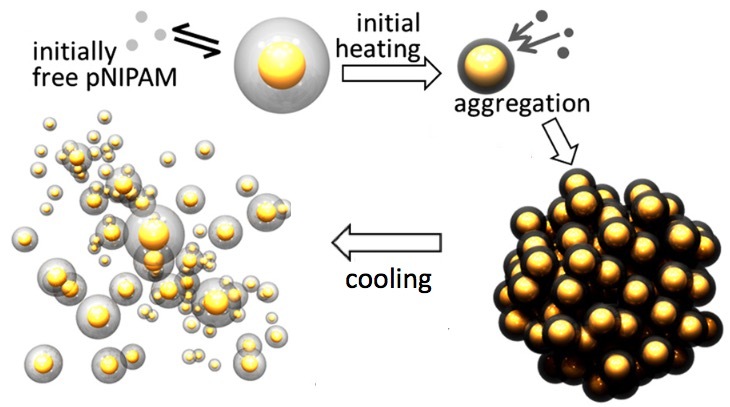 Cooling causes the nanoparticles to rapidly take on water and expand in a sudden explosion. KurzweilAI has covered a number of kinetic nanorobotic and microrobotic devices, including 3D-motion nanomachines from DNA, a magnetically controlled “nanoswimmer” for delivering drugs, sperm-inspired microrobots controlled by magnetic fields, and bacteria-powered microrobots. However, the forces exerted by ANT devices are several orders of magnitude larger* than those for any other previously produced device, according to the researchers. ANT devices are bio-compatible, cost-effective to manufacture, fast to respond, and energy-efficient, according to the researchers. Possible applications include microrobotics, sensing, storage devices, smart windows and walls, and especially biomedical uses, since the spring process occurs at biological temperatures (32 degrees C or 90 degrees F). The team plans to initially commercialize this technology for optically controlled biological microfluidic pumps and valves. The research is funded as part of a UK Engineering and Physical Sciences Research Council (EPSRC) investment in the Cambridge NanoPhotonics Centre, and by the European Research Council (ERC). * On the order of nN compared to typically 10 fN/nm2, with up to GHz switching speeds. 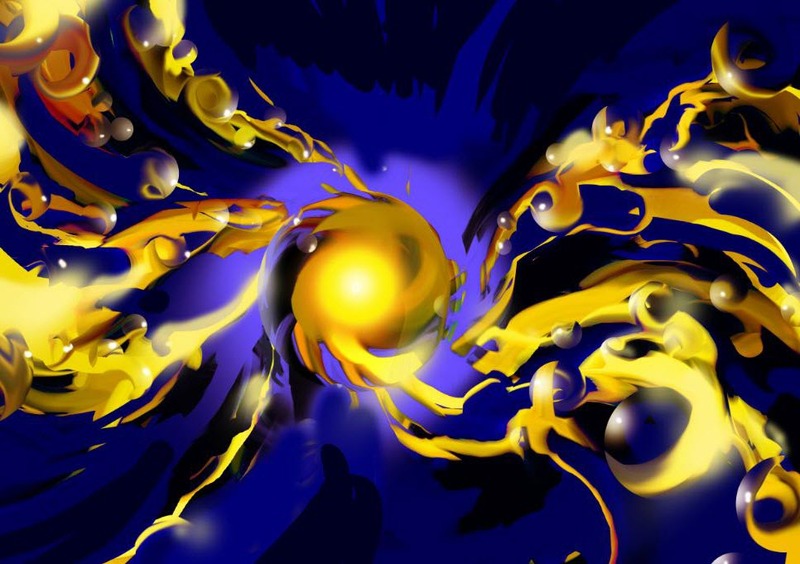 Nanoactuators and nanomachines have long been sought after, but key bottlenecks remain. Forces at submicrometer scales are weak and slow, control is hard to achieve, and power cannot be reliably supplied. Despite the increasing complexity of nanodevices such as DNA origami and molecular machines, rapid mechanical operations are not yet possible. Here, we bind temperature-responsive polymers to charged Au nanoparticles, storing elastic energy that can be rapidly released under light control for repeatable isotropic nanoactuation. Optically heating above a critical temperature Tc = 32 °C using plasmonic absorption of an incident laser causes the coatings to expel water and collapse within a microsecond to the nanoscale, millions of times faster than the base polymer. This triggers a controllable number of nanoparticles to tightly bind in clusters. Surprisingly, by cooling below Tc their strong van der Waals attraction is overcome as the polymer expands, exerting nanoscale forces of several nN. This large force depends on van der Waals attractions between Au cores being very large in the collapsed polymer state, setting up a tightly compressed polymer spring which can be triggered into the inflated state. Our insights lead toward rational design of diverse colloidal nanomachines.